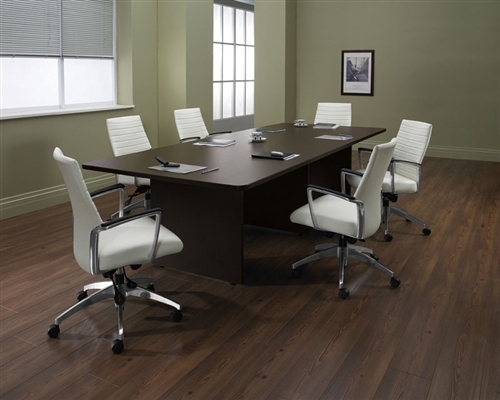 This fashionable conference room table from Global is available in a variety of designer finish options and sizes to meet the individually needs of any professional meeting area. Global crafts high quality furniture that's made to order and backed by a limited lifetime warranty. Pair this table with a wide range of complimenting chairs from this industry leading brand. both sides with with high performance, thermally fused laminate. All tops are 1 1/8" thick with high performance, thermally fused laminate on both sides. Additional tops including racetrack and boat shape available.